This course will educate attendees on the applications for micro-farming in living spaces, as part of a new generation of WELL-Standard and Fitwel-compliant buildings that promote occupant wellness, and offer sustenance as well as shelter. Fee: $10 for members and $20 for nonmembers. Our meeting space is generously donated by the City of Charlottesville. An experienced landscape designer and former teacher shares insights and inspiring images of her earth and child-friendly designs as well as from schoolyards visited on her recent study tour of Germany and Sweden. Participants will learn about sustainable, engaging spaces that bring nature to the places where children are. Discover essential elements of natural play and learning spaces and their importance for healthy development: natural climbing, digging, and pretending places; outdoor art and literacy spaces; beautiful native and edible kid-friendly plants. A really la rge portion of human’s waste stream is totally compostable, but a lot of us still don’t compost it for a variety of reasons and it ends up in a landfill. Zera Food Recycler is a futuristic solution (sadly, not quite a Mr. Fusion) that automatically processes food scraps into plant food in 24 hours. Unfortunately it is expensive right now and involves replaceable filters, but it is just the first step in a bringing another tool to reduce landfill waste online. It is great to see inventors asking the right questions. Can technology ultimately save us? While in college my friends and I built a garden on top of a giant rotting tree stump outside of our rental house. That small 4’x2′ garden produced more cucumbers and tomatoes than the four of us could eat without much watering. We didn’t have a clue that we had built a garden system called hugelkultur, but it worked better than we could have imagined. If you have piles of rotting wood laying around (or know someone that does) put them to use under a garden! 1. 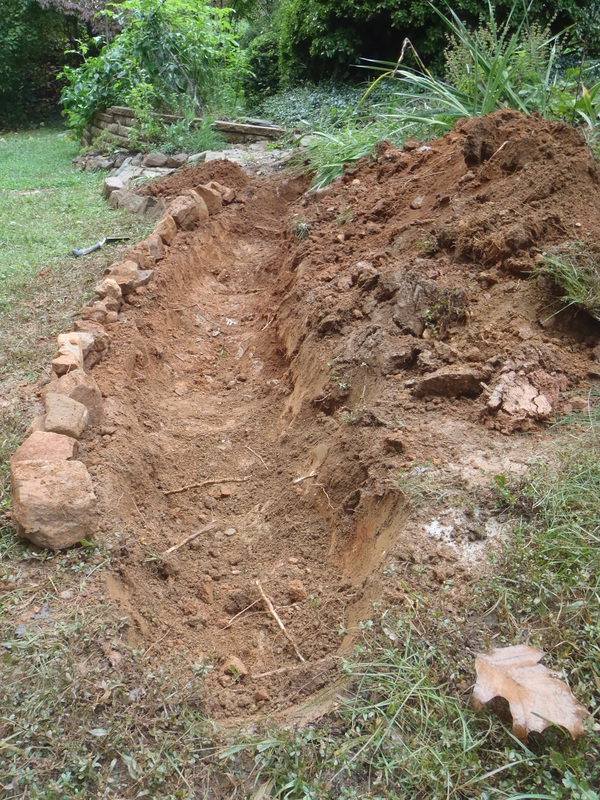 Dig a trench that followed the existing contour of the site. 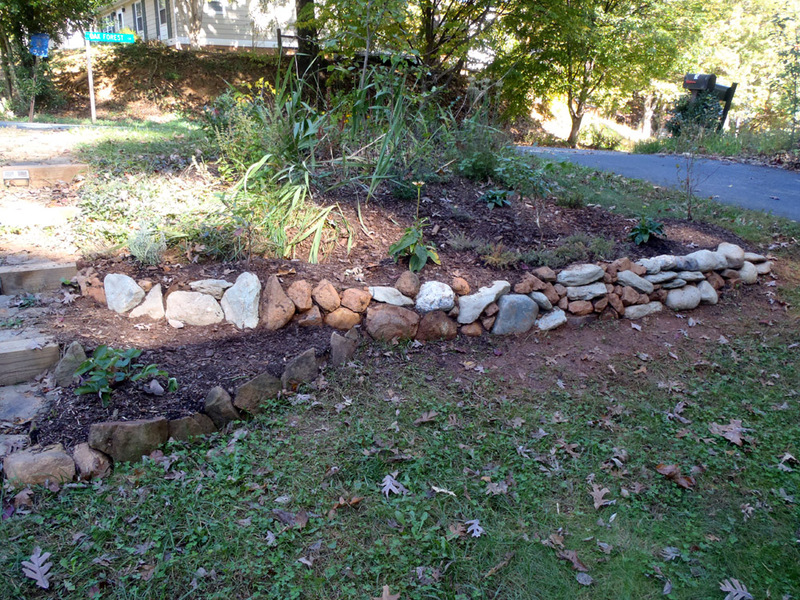 We are building a swale as well as burying logs, so that we will also capture rainwater as it flows down the slope. 2. 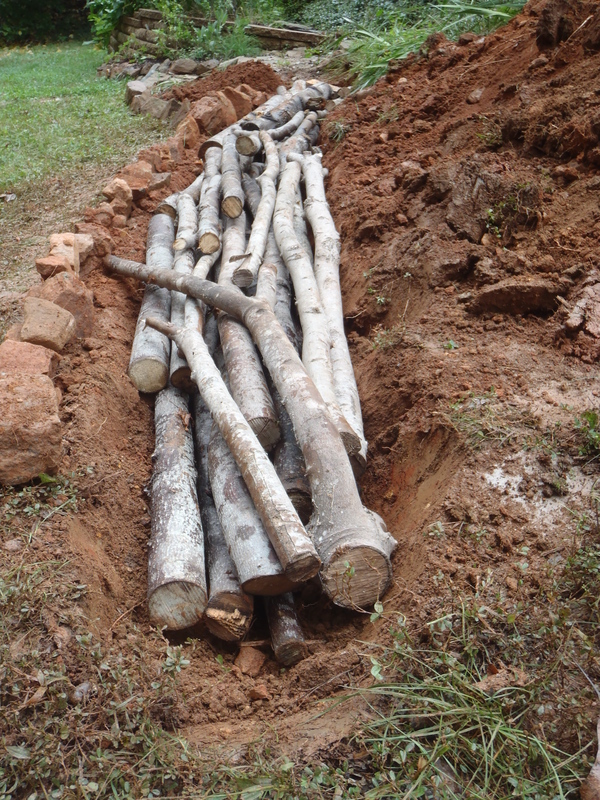 Fill the trench with logs and sizable branches that have been accumulating from all of the storms we have around here. 3. Cover the logs with dirt that was excavated earlier. Be careful and fill in all of the holes between the logs which is tricky if you have clay like we do around here, if you don’t I imagine that the mound will sink over time. 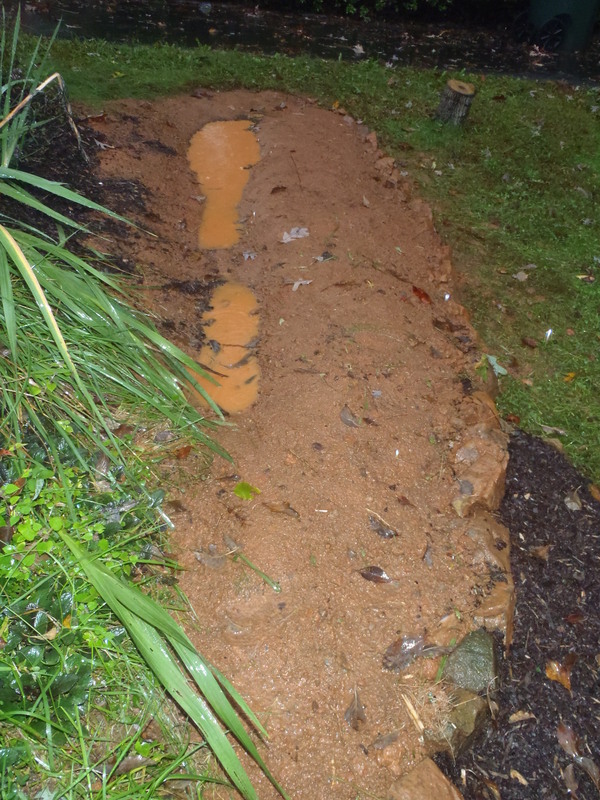 Check out the water pooling during a big storm in the trench (called a swale) behind the new mound of earth (called a berm); it’s already working! Don’t worry, that water disappears quickly into the soil after the rain stops, though if it doesn’t, add more mulch and build the soil so that it can hold more water. 4. 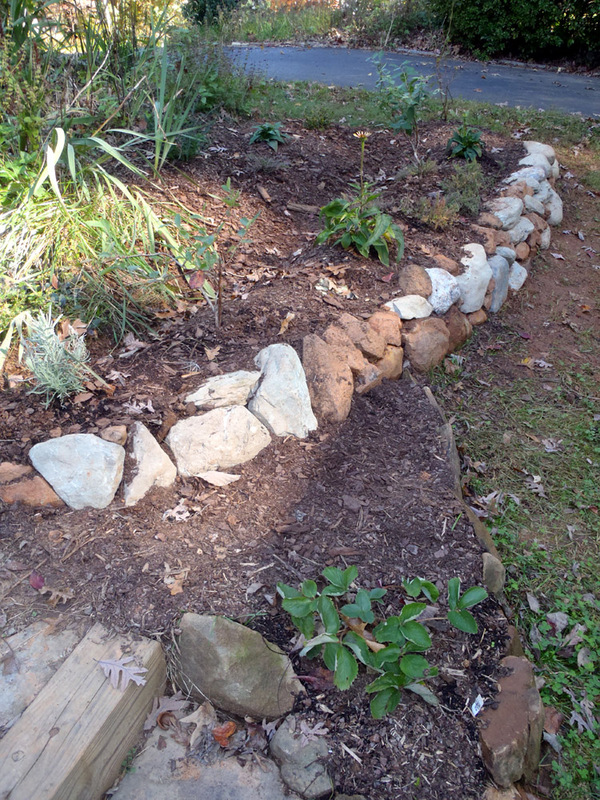 To keep erosion down we gathered rocks from a field that was plowed too deep and built the terrace edge. On top of the new mound of dirt we planted blueberries, strawberries, thyme, lavender and some flowers. Local pine mulch was put down on top as well to keep the weeds out and cover the bare soil. Now we wait until next season! There are so many different types of greenhouses and clever adaptations that books upon books have been written on the subject. Has anyone seen really clever designs in action? Two great classes are coming up in the charlottesville area, both are donation funded and located at the Ivy Creek natural area. The first is an introduction to Underground Housing on Sunday, April 20, 2014 from 11am – 7pm. If you’d like to get a little background before you go, look up Malcolm Wells in google! The second is an introduction on shaping the landscape to build soil, improve fertility, and make food for yourself! Sunday, May 4, 2014 from 11am – 7pm in the Ivy Creek Natural Area Educational Building. If you’d like to get a little background before you go, look up Permaculture Earthworks in google!